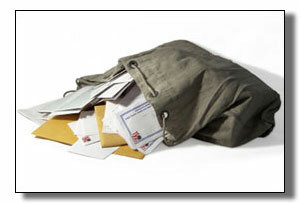 Pro Mailing Systems - The Mailing Experts! In today's increasingly competitive environment, Direct Mail is the best way to reach your audience and speak to them, one-to-one. Flexibility: You can mail anyone your message, at any time, using a variety of formats. You can send postcards, letters, color brochures, personalized letters, free samples, co-op mailing, even a bowling ball! The choice is up to you and your budget. Targetability : Choose precisely the audience you want to reach and speak to them, and only them, one-to-one. Measurability : There's no guesswork. By tracking and analyzing your mailings, you'll know the response rate. Accountability: When you see how well direct mail works, it becomes a proven justification, a "self-funding" medium, if you will. Privacy: Not only can you reach your customers without your competition's knowledge, but you can also allow your customers to see your message, without distraction. You get more bang for your buck. Studies show that, on average, every dollar spent on Direct Mail advertising brings in $10 in sales - a return of more than twice that generated by a direct television ad. Believe it or not, over 50% of recipients of Direct Mail read it immediately, and of those, over 40% found the information they received useful. You reach prospects that actually WANT to hear from you. More than half of all American households say they would actually like to receive more Direct Mail or that they would enjoy receiving some. Consumers are receptive. Americans spent more than $244 billion in response to Direct Mail in past years. It's a powerful revenue-building tool. By using Direct Mail to reach out to consumers, businesses can expect sales to increase more than 7%, and is that number is still growing today. There doesn't seem to be an end to its potential. In fact, Direct Mail sales reached $421.3 billion in past years. And sales driven by Direct Mail are projected to increase by $8.3 billion per year. Direct Mail works. Perhaps that's why, in past years, 56.7% of the adult U.S. population placed an order by mail for a product or service.